The History Theatre is currently producing two plays in rep, both dealing with the effects of war on the soldiers who fight in them. The Things They Carried is based on the semi-autobiographical collection of short stories by Tim O'Brien, a Minnesota man who was drafted out of college in 1968 and sent to Vietnam. Lonely Soldiers: Women at War in Iraq is also based on a book - a series of interviews with women who served in the Iraq War. I saw both plays in one day, which makes for a pretty heavy day. But it's a nice pairing of plays that show different perspectives of war. Both tell really powerful and important stories and feature fine acting, but one affected me much more deeply. After seeing this play I was completely devastated. I had a hard time shaking it. It was one of the most powerful experiences I've had at the theater in quite some time. 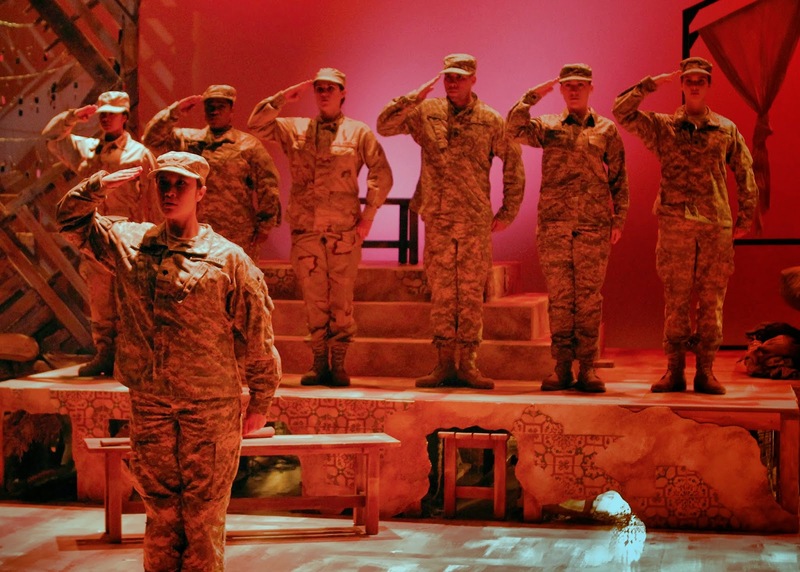 Because it's not just theater, and it's not just history (both of which the History Theatre does so well), it's about very real and devastating issues facing women in the military. 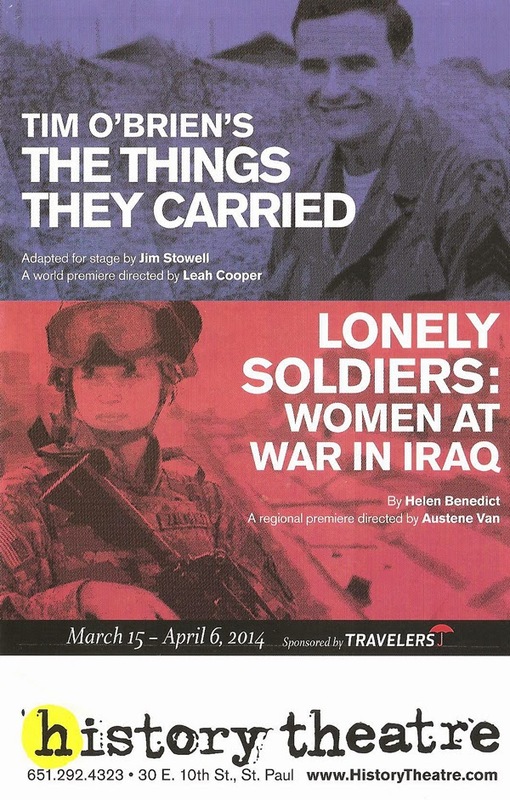 Based on the 2009 book by Helen Benedict, who also wrote the play, Lonely Soldiers tells the stories of seven women who served in the military in Iraq. Helen spent countless hours interviewing these and other women over a period of several years, and their words form the text of the play. The result is a very real and brutal examination of how our military, and our society in a broader sense, tolerates harassment and assault of women. The play is constructed as a series of monologues using the women's own words. They speak directly to the audience, sharing their varied reasons for joining the military (economic, family pressure, rebellion) and their experiences that were so different from their expectations. Each story is different, yet they're all the same, as they all experience various forms and degrees of harassment from their male counterparts and superiors, with no one to talk to about it. The stories unfold separately, and it's not until the end, when they're home and trying to process what they've been through, that the women start to look at each other and talk to each other, and there's a feeling of relief that can finally share their stories, with each other and with the audience. This cast of seven women (and one man, Santino Craven, who has the thankless job of portraying the mostly not-so-nice men in the women's stories), so completely embodies these characters that you almost believe that they are them. Jamecia Bennet, Shana Berg, Dawn Brodey, Hope Cervantes, Tamara Clark, Meghan Kreidler, and Rhiana Yazzie all give such devastatingly real performances, under the direction of Austene Van, who noted in the program, "The notion that someone who takes on the responsibility to serve and protect with their very lives is left unprotected and damaged forever by those who should be trusted is difficult to fully grasp." Indeed. These women's lives is so far from my experience, I can't even imagine a world like that, but now I don't have to because this play allowed me to experience a little bit of it. And that's about as close to war as I ever want to get. I had tears in the back of my eyes for the entire ninety minutes, and I don't even know anyone in the military. There was a talk-back after the show I attended, with the playwright, director, and cast onstage to answer questions. There were several women vets in the audience, and those who worked with them in their recovery, and some of them stood up and told similar stories to what we had just heard, which brought another level of reality to the experience. Because of the book and the documentary that it inspired, The Invisible War, there is hopefully more awareness now of how women are treated in the military, but it's certainly still going on. 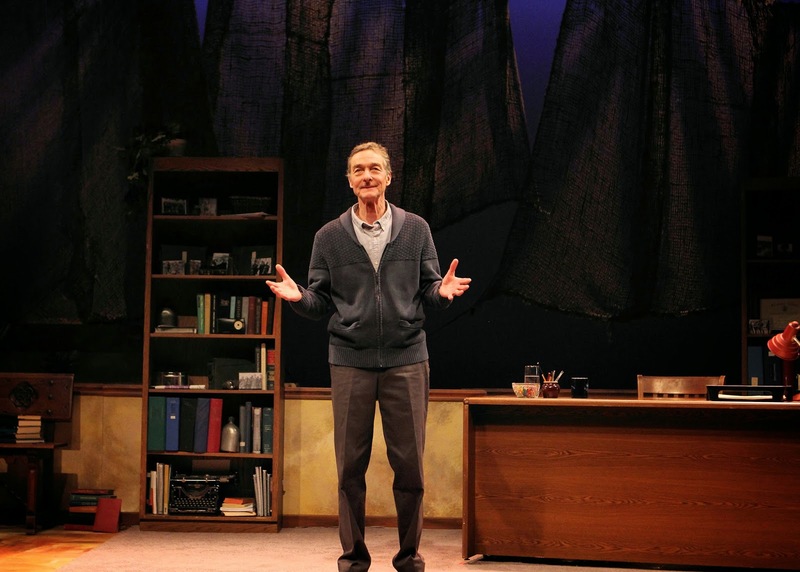 In this one-man show directed by Leah Cooper, Stephen D'Ambrose plays Tim O'Brien, the author of the book. He begins by sitting at his desk writing, and soon speaks directly to the audience, telling stories of his time in Vietnam. It's as if he's reliving the stories as he's writing them down. He occasionally repeats a line as he goes back to his desk to write it in his notebook, almost as if he's telling it for the first time and wants to get it down on paper before he forgets it. As he's telling the story, Stephen also plays many other characters, including his buddies, his family, and the man who "saved his life." Many stories and vignettes are told in the two-act play, but the most compelling are about his trip to the Canadian border shortly after he was drafted, where he contemplated leaving the country to avoid going to war. It's an extremely compelling story, well-told by the author and actor. The second act largely focuses on the death of his best friend, and his journey back to Vietnam 20 years later to attempt some closure. All of the stories are told with beautiful, almost poetic language (most of which I assume comes from the book), wonderfully delivered by Stephen. This is theater at its most basic form - storytelling. Since the two plays alternate dates over the next several weeks, they share the same basic set (designed by Sarah Brander). The sand-colored floor and weathered wooden slat backdrop works for both. The steps and rock formations in Lonely Soldiers are replaced by office furniture in The Things They Carried. It's an efficient sharing of space. These two plays really fit well together, but if you can only see one of them, I would recommend Lonely Soldiers. Stories from Vietnam, although still important and relevant, have been told in many forms over the past 40 years. But the stories told in Lonely Soldiers have only recently begun to be heard, and they need to be heard. See the History Theatre website for more info on both plays (and you can find discount tickets for Lonely Soldiers on Goldstar). The result is a very real and brutal examination of how our military, and our society in a broader sense, tolerates *and even promotes* harassment and assault of women. That sounds like a very profound experience. I look forward to the opportunity to see this play. Nearly 20,000 service members are raped or sexually assaulted every year. Just this week, the officer in charge of prosecuting sexual assault cases was suspended for sexual assault. It's a dirty, dirty business.